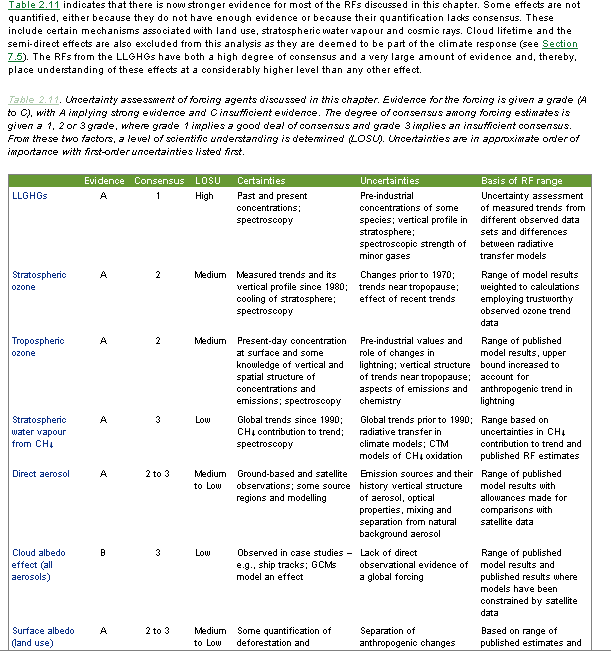 Did the IPCC adhere to its own guidelines, or just twisted them whenever convenient? I hope you can help me with an old, nagging questions that I have regarding the IPCC’s AR4. To be clear, I have read the whole of the WG-I report. There is absolutely no need to read beyond that, since WG-II and WG-III are mere science fiction once you understand the lack of conclusion in WG-I. 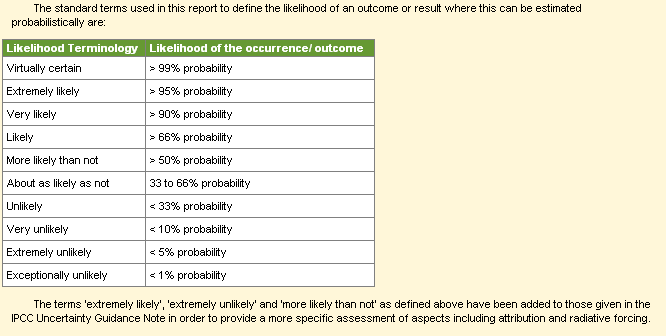 Who decided, and when was the decision made, to add the uncertainty category “more likely than not” to the uncertainty table (Table 4) in AR4? The question is fundamental since it turns a perfectly reasonable document into a political club. 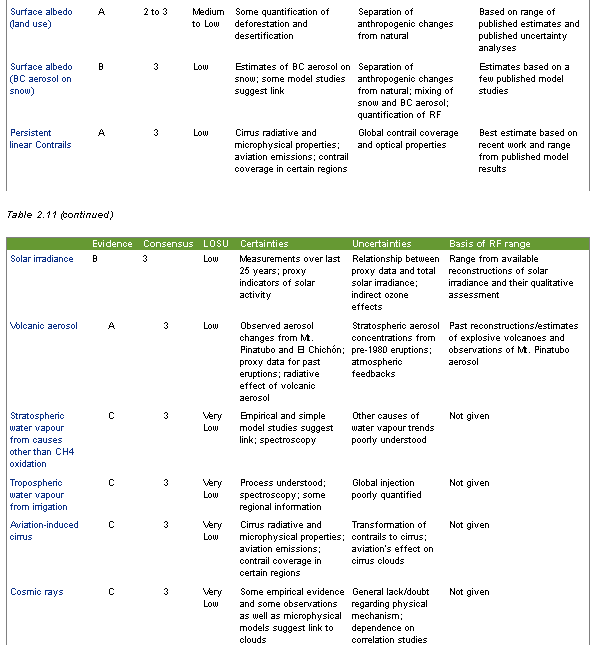 Clearly, an honest IPCC panel hammered out a reasonable likelihood scale in July 2005, published as an annex to AR4 in 2007. 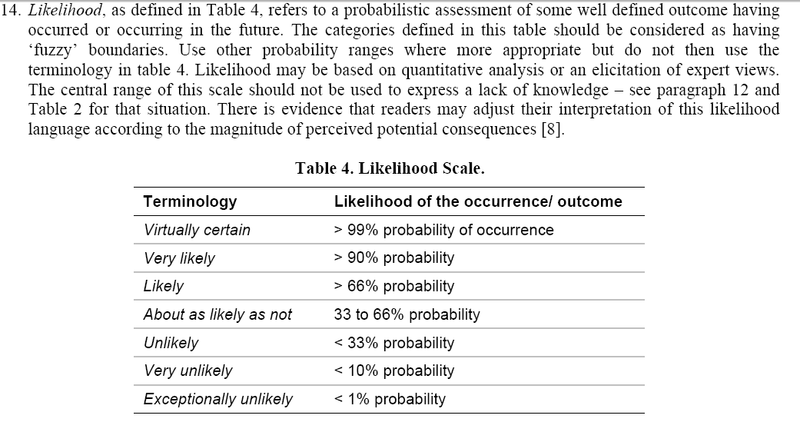 Table 4 in the uncertainty guidelines document indicates the terminology “as likely as not” for the probability zone around 50% (from 33% to 66%). This is perfectly reasonable, since a 50-50 likelihood or thereabouts has the same meaning as a coin toss. The document further instructs the authors of AR4 to refrain from messing with these terms (note 10). [NOTE BY MAURIZIO: Box 1.1 and Box TS.1 claim that in AR4-WGI-Chapter 2 “the basis on which the authors have determined particular levels of scientific understanding uses a combination of approaches consistent with the uncertainty guidance note as explained in detail in Section 2.9.2 and Table 2.11“. Neither that Section nor that Table explain anything of the sort. With this wondrous little change the AR4 is no longer a document that must admit that human activity may or may not (we don’t really know) cause an increase in hurricanes, in heavy precipitation events, in heat waves, droughts and more. 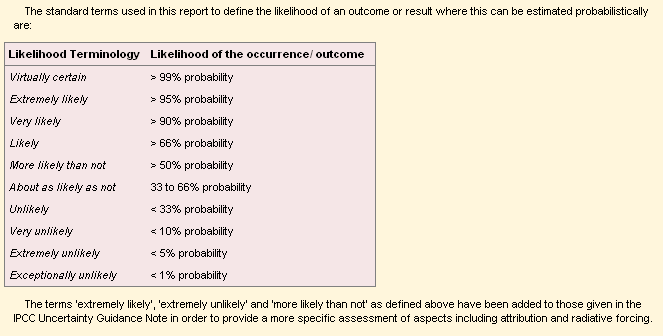 Instead it says “more likely than not” in these cases. Obviously, the original terminology only allowed for a vague “we don’t know” whether the coin will land heads up; it sounds much better to say that the coin is more likely to land heads up than tails up. Scanning the two-year-old news I find no references to enraged citizens. I wonder if it is possible to find the authors who are responsible for this semantic “sleight-of-hand”? Have to admit, having read an AGW blog about COP-15 I could not avoid committing the sin of wasting time reading the Copenhagen Accord. And yes, there is an interesting and quite telling concept after all. It shows that no scientist, AGW believer or otherwise, has likely participated to the writing of the Accord, or has even been involved in reviewing any of it. 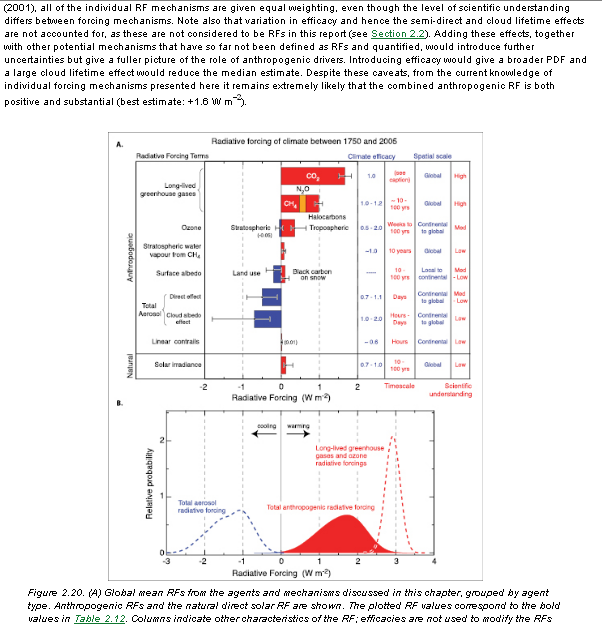 To understand the absurdity of the Accord as it stands, imagine the world of 2050, with giant emission reductions already achieved, and powerful models showing that “anthropogenic interference” amounts to +1.7C. Still, if by pure misfortune natural variability sums up to +0.4C, the Copenhagen Accord says we have failed (despite having achieved the wildest dreams of the average 2009 greenie). Imagine now another world of 2050, with no emission reduction at all and “anthropogenic interference” running at +3C. Still, if by pure stroke of luck natural variability sums up to -0.9C (eg a series of giant volcanic eruptions from 2045 onwards), the Copenhagen Accord says we have succeeded (despite having done nothing at all). Sadly, all of that shows how silly is the idea that there is something good in the Accord because it has followed the lead of scientists. In truth, the Accord has made the IPCC irrelevant apart than as a confirming body for whatever the USA and China would like to see agreed upon regarding “climate change”. You know something very odd has happened in Copenhagen between Friday and Saturday when Luboš Motl and Plane Stupid’s Joss Garman write more or less the same thing about it. In the meanwhile, RC is silent, Stoat is silent, tamino is silent, Desmogblog has a pathetic “let’s be cheerful” attempt at blaming “politicians”, and Monbiot is entering paranoia territory. Finally, a consensus has been reached! 100% of the people all over the world agree that 45,000 humans travelled to Denmark and made a lot of fuss for about two weeks, and all we’ve got is a declaration that is not worth a single paragraph of commentary. Give me another UN conference like this and we’ll be back to the League of Nations. When push came to shove, the Powers That Be did not care at all about the opinions of those listed above. I wouldn’t be too harsh with the Maldives, most of the African nations, etc. They do not have much power to do anything at UN level, anyway. Russia has lost a bit, by not being included in the final five signatories, and for the same reason Brazil, India, and (mysteriously) South Africa have gained a little. But let me say very clearly, as UK taxpayer I find the performance of the Ed Milliband particularly awful, and the absolute unimportance of anything Gordon Brown had to say especially embarrassing. Go, go, Gordon go!! Is NASA Too Big for Antarctica?